By Dan Ambrose: Former two time World Boxing Organization (WBO) welterweight champion Paul Williams (39-2, 27 KO’s) goes up against unbeaten Cuban Erislandy Lara (15-1, 10 KO’s) next month on July 9th at the Boardwalk Hall in Atlantic City, New Jersey. This is good fight but a very risky one for the 29-year-old Williams, as he’s coming off of a 2nd round knockout loss to WBC middleweight champion Sergio Martinez in November of last year in an especially bad knockout for Williams. 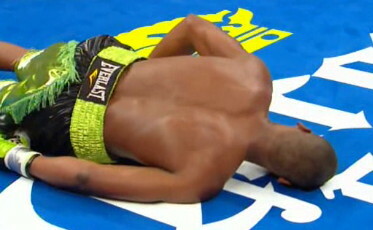 Williams was literally knocked unconscious by a hard left hand from Martinez that put Williams down flat on his face and left him with his eyes open despite having lost consciousness. Going from that fight into what could be another tough fight against Lara has got to be one of the boldest moves that a fighter could make, because the southpaw Lara has good hand speed and can punch. Lara. 28, might have got the call for this fight because of how bad he looked against pressure fighter Carlos Molina in a 10 round draw on March 25th. Lara struggled with the constant attacking style from Molina and was very fortunate to have gotten a draw out of the fight because many boxing fans saw Lara losing. But with that said, if Lara connects with one of his big left uppercuts on the chin of Williams he could take him out. If Williams beats Lara, he’s hoping to get a third shot against Sergio Martinez. The two fighters have split a pair with Williams winning the first fight by a questionable 12 round majority decision in 2009, and the Martinez avenging the loss with a 2nd round KO in November 2010. In the rematch, Martinez changed his game to a power attack, going after Williams with nothing but power shots from the 1st round. Martinez able to connect repeatedly with powerful left hands and Williams looked flustered from the start by the strength of Martinez’s shots. Instead of backing off and using his long reach advantage, Williams waded straight in trying to replay Martinez with power shots of his own. This made it simple for Martinez to tag and finish Williams off with a big left. Martinez really seemed to improve after beating Kelly Pavlik last year after Martinez’s loss to Williams in their first fight. Martinez gave Pavlik all kinds of problems in the last four rounds of the bout when he turned up the power on his own shots and began to really batter Pavlik. Martinez then seemed to continue with that style of fighting in his next bout against Williams and was able to take him out quick. I think Williams would be crazy to fight Martinez again. Martinez proved that he’s got too much power for Williams and if they were to fight again, I can see Williams getting badly hurt for a second time.